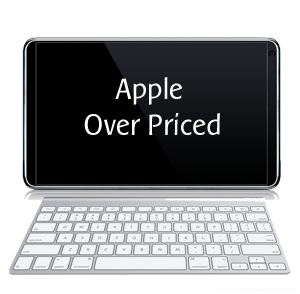 Apple is over priced is not new thing. Its not that Apple makes very high quality product and so its manufacture cost is high, and so Apple’s products are costly. But the truth is that Apple’s product is very much over priced. According to a bill of materials (BOM) analysis by Brian Marshall of BroadPoint AmTech, the total cost of goods inside Apple ‘s 16GB WiFi- iPad is only $270.50, but apple sales same product for $499. Thus Apple makes $208 from each sale of $499 iPad which is around 43%. Its almost double the cost price. I like Apple products, but because of their over pricing I hate Apple products. Hi Im having issues looking for discounted Ipad Accessories. Any advice on a good website to buy some ? ?